Hot off the heels of the last feedback post, it’s time to take a look at the other two primary feedback and information systems that Halo uses: HUD waypoints and the multiplayer announcer. Unlike the previous systems, which were handily integrated into the art and action of the game, these systems lie a layer above, trying to stay balanced between being helpful and being intrusive. The games up to this point have managed this with varying degrees of success, but recent showfloor videos of Halo 4 matches are worrying in this regard. Waypoints and HUD indicators have traditionally been used in very specific, often time-limited roles in order to portray information on gametype objectives, and they’re very effective at it. Things like the location of dropped flags, of bomb arm spots, of Oddballs and their carriers, of hill and territory locations, and even of ordnance drops in Invasion gametypes. The word “unintrusive” is of extreme importance when discussing how well waypoints do their job. The very moment they become a distraction, or obstruct the player’s vision and interrupt their actions, they have failed. A good example of where waypoints fail is Reach’s firefight ordnance indicators. These are persistent, not disappearing until the weapon has been picked up, and they are fully opaque, blocking view of any enemy behind them. When I set up at the end of the Walkway on Courtyard in order to funnel the enemies to me, there’s often a big, green cube labeled “ORDNANCE” obscuring my vision. This isn’t helpful, it’s annoying. Yeah, I goddamn know there’s a target locator there, thanks. Most of the time, Halo has used waypoints to great effect, and very sparingly. They are used to convey extra, useful information, like the time left to return a flag, and they do it subtly by (for example) integrating the reset bar or time left until hill reset into the HUD element art itself. In Bungie’s Halo games, the highest number of waypoints I can remember encountering at once is five or so, in Territories gametypes, spread across the map. The waypoints did not follow the player by appearing at the edge of the screen when he turned away, and even then, that many was specific to that gametype. In a normal Objective setting, there might be three on the screen at very fleeting moments, max. Note that this is discounting player service tags, since that varies from playlist to playlist and isn’t indicative of a design philosophy as such. How does this contrast with what 343 is doing with Halo 4? I love them to death, but they are littering the screen with Reach Firefight ordnance-style waypoints. Consider the screenshot below, and my deepest apologies for the quality — I’ m workin’ with what I got here. 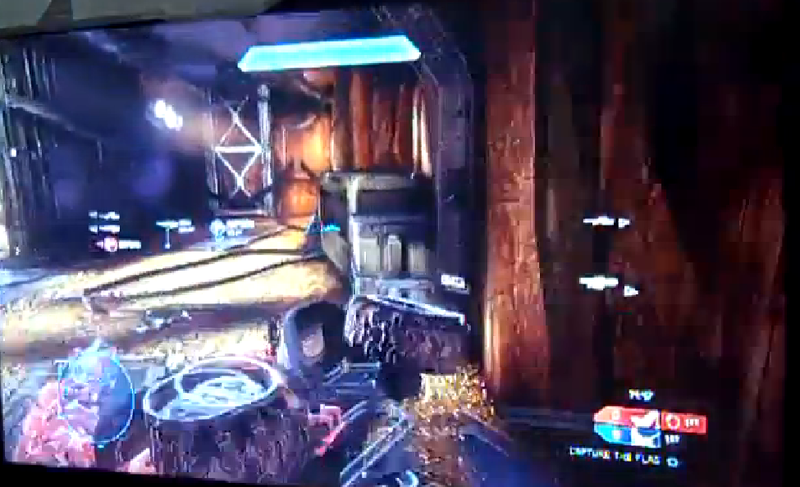 It was taken from a video off of Bravo’s YouTube channel showcasing CTF on Exile. Note that there are seven waypoints on the screen, and this was taken mere seconds into a match. Those weapon waypoints only disappear when the weapons have been picked up, and grenade spawns will be indicated by another waypoint when the player gets in closer, while these power weapons are visible from any location on the map. These indicators follow the player when he turns, appearing as icons with arrows as can be seen in the screenshot. If that’s not enough for you, a grenade thrown in your vicinity will pop up yet another HUD element. Additionally, the two flag indicators have the potential to flash — a change I think is a great, unintrusive way to draw the player’s attention towards the most important elements of the match. But you know what? When taken in combination with the half dozen other waypoints, it just seems ridiculous, even comical, as a whole. Note: a direct feed match viewed later did not have any waypoints at all, which makes me wonder if they are not visible in Theater. Information overload is a real danger. This isn’t to say that I disapprove of all the changes. Far from it. Even apart from my approval of the flag waypoint being flashier than the others, I think that drawing the player’s attention to drops is a totally valid method of making them aware of the state of the battlefield. I love that they brought back a HUD element that has been missing for five years: the flag return times being visible and obvious. But I also think that doing pushing out all these drops at the front makes for a very messy experience. Yes, you give players the ability to choose which route they want to take based on which weapon dropped where, and that’s great. But I don’t think it’s necessary in the context of how Halo has traditionally handled power weapon spawns. That system being changed did necessitate giving additional information the player, but I think that in combination of having so many ordnance weapons spawning in at once at the beginning of a match and giving each of them a waypoint, you run the risk of overloading the player with information. Something like Coagulation in Halo 2 had three weapons that I would consider giving a waypoint for: the two snipers and the rocket launcher. Here, on a map that is much smaller, you have seven. Even things that might not be that useful to fight for, like the SAW, get a waypoint. As someone who hasn’t played it, it’s hard to tell if these new elements are necessary given how little I know about the weapon spawn system at this point, but I can’t say I’m a huge fan as it stands. Another key element that Halo has used to convey information is the multiplayer announcer. Jeff Steitzer’s iconic voice has served a dual purpose in past games: he announces important moments in objective gametypes, like the flag being stolen, and he congratulates the player on feats of skill. With every game he has been given a larger and larger role, moving from solely multi-kill and killing spree notifications in Halo CE to a whole plethora of congratulatory announcements in Reach. Even then, it seemed like some of them were unnecessary. Did he really need to shout “HEADHUNTER” every time I brought even a single skull to the capture point? Proooobably not. Gripes aside, he was usually relegated to moments that the player would naturally have felt elation during, while more mundane moments were just given small, unobtrusive medals to fellate the player. So what has changed with Halo 4? It seems to me that Steitzer has contracted a case of motormouth. Things that were previously rewarded with a simple medal, like headshotting a sprinting player, now warrant a hearty “HEADCASE!”, accompanied by the controversial middle-of-screen text. I can understand why they want the announcer to have a bigger role, I really do. It’s cool to have someone there saying “Hey, you did a cool thing!” But I also think that rewarding the players with it for very mundane things, like a flag carrier kill, dilutes the reward for truly amazing moments. If I can get him to shout out from a Headcase and have that little burst of dopamine, what makes him saying “Overkill!” any more inherently satisfying? There’s still something resembling a feeling of accomplishment about it, but the more things he shouts, the less important each line becomes. The thing that prompted this post, though, is that the game deems it necessary to shout “CARRYING FLAG” at the player as if it isn’t immediately obvious that a flagpole is in your hand. Guys, blind people don’t generally play a lot of multiplayer shooters, and adding both an audio cue and giant, always-present text informing me that I have the flag is a little condescending. There are some truly fantastic ways that they’ve improved the announcer’s role in CTF, truly. Having him directly state, “Protect your flag!” or “Kill their carrier!” when your flag is dropped or stolen, respectively, is incredibly important. “Flag Taken” and “Flag Stolen” are ambiguous, they have the potential to confuse people who might not play CTF all that much. This is a simple, unintrusive way to eliminate that confusion without being annoying about it. But those two announcements are in distinctly different categories than picking up the flag, they really are. They are things happening in the environment that the player doesn’t have direct control over, and might be happening large distances away from him. They’re more warnings than announcements. When you pick up the flag, it’s in your face, it’s obvious, you performed an action to make it to the flag and grab it. It is purposeful, not passive. I’m 100% sure that it was not intended as sounding patronizing. But…it kind of feels that way, the same way that the constant rewarding text that occurs in combination with medal rewards feels patronizing, and artificial, or pandering. Pick a word. 343 are making the game accessible, and that’s a good thing…but some of the ways they’re doing it doesn’t sit very well with me as a longtime player. As with most things, there have been tremendous strides forward with what 343 has done and how they’re carrying the series forward. And as with most things, there have been some very strange additions that I don’t feel add to the experience, and in my opinion, detract from it. There’s a strong chance that everything I have a problem with is a total nonissue. I certainly hope so, and I’d love to see it in action.